Since cold & flu season is upon us and it’s time to stock up on my natural remedies. I have already used this one with great success, just a few weeks ago. This combination remedy works great for colds and flus going around. There was a very nasty sinus infection/ congestion going around and it seemed to linger longer (some of my friends still have it). I started to get the symptoms and immediately started taking this remedy and within 2 days I was 90 percent better. You can buy this remedy even at Walmart, it is not tough to find. PEKANA Flu Kit – Is for the acute stages of flu. Immediately take the Flu Kit at the first onset of the flu. These remedies work very quickly and have been “life savers” for our family. For later stages, please take only for the indications and order separately. FEPYR is when an acute respiratory tract infection or gut infection where a high fever is present, FEPYR can be used to help control the fever. This can provide quite a bit of relief, allowing the patient to sleep and get the rest needed to recover. In addition, this remedy contains ingredients that help the body mount an immune system response against viruses. Thus, FEPYR is not just for symptom relief, but actually helps fight the infection. 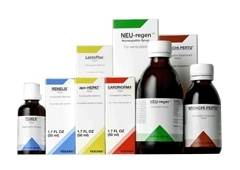 apo-INFEKT is for acute bacterial and viral infections that need to be treated successfully. apo-INFEKT works as an immune system stimulant and biological antimicrobial to eliminate pathogens. Unlike allopathic medications, this plant remedy does not burden the body, but rather helps stimulate an immune response and eliminate toxins that can block the metabolism. Its antibacterial qualities are essential for treatment of acute infections of the bladder, kidneys, bronchials and other organs. All pus-producing infections such as bronchitis, tonsillitis and otitis media indicate the need for apo-INFEKT drops, which also stimulate the lymphatic system and address accompanying symptoms such as fever and weakness. In addition, apo-INFEKT drops treat intestinal tract infections to help neutralize toxins. Influenza is a virus that typically begins to appear in the Fall and then recedes as Spring progresses. A typical influenza virus has many symptoms as a common cold, but often starts with a high spiking fever, shaking chills, headache, muscle ache, and pain when moving the eyes. Here are a few natural therapies. 1. ELDERBERRY– An herb that appears to have direct anti-influenza viral activity. Children as young as 6 months of age can use this (although some people have used the product in younger children). There are many elderberry products on the market. In the office we carry the encapsulated liquid extract (Phyto-Caps) from Gaia/Professional Solutions. The dose for older children and adults is 2 capsules 4 times a day. 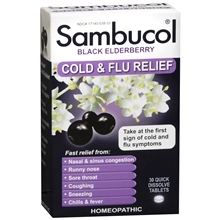 For younger children and people who do not swallow pills, we carry Sambucus, (by Nature’s Way) which is an updated version of Sambucol. Younger children should take 1 teaspoon 4 times a day, and older children and adults should take 2 teaspoons 4 times a day. There is a newer concentrated liquid extract fro GAIA herbs called “Black Elderberry Syrup”. This product contains organic sugar, but it is also about 4x more concentrated then the Nature’s Way product, so 1/4 of the above dose would be given of this product. 2. VITAMIN C – preferably as Ester C or Buffered C. Doses listed here are the total amount per day and should be divided in 3-4 doses. For children under 1 year of age give 100mg per month of age. For children up to age 5, 1000mg per year of age, and as much as possible for older children and adults, as long as the stool does not become loose. Our office has capsules that are 250 and 500mg, 250mg chewable tablets, and a powder. 3. ZINC – this mineral should be given divided into at least 2 doses spread through the day. For children under 2 -12 months old give 10-15mg a day, for children between 1 and 3 give 20-30 mg daily, for older children give 50 mg a day, and adults can take 75-100 mg a day. This should be divided into 2-3 doses throughout the day. 4. LARIX (similar to Echinacea) – This is an herb derived from the bark of the Western Larch tree. The active ingredient, arabinogalactan, is the same as Echinacea, which is believed to increase production of white blood cells. Larix has been found to be much stronger than Echinacea when using similar amounts, and can be used by patients over 6 months of age. For adults and older children, the dose is 2 tablets 3 times a day, and younger children who can swallow pills should give 1 tablet 3 times a day. There is also a powder available. Adults and large children should use 1 tablespoon 3 times a day, and smaller children should use 1 teaspoon 3 times a day. For children less than 6 months of age, there are alcohol free extracts of Echinacea that can be used. For children under 3 months of age use 5 drops 4 times a day and for children 3-6 months use 10 drops 4 times a day. Echinacea should not be used as a daily preventative. We follow his protocol with great success. You can read more about his recommendations here. These are just some of my favorite products on the market. Each year I learn more about what remedies work best for my family. If you have any questions feel free to ask. I am already receiving calls from friends and family, so I know everyone is gearing up. Make sure you and your children get plenty of rest and eat nourishing and healthy foods during the winter. Winter is a beautiful and restful time of the year. Enjoy it by staying well! Check out Best Flu Remedies from last year.